I didn’t create this system, it was done by “El Mostafa Belkhayate”, winner of the Gold Trophee 2009 Technical Analyst ( Paris Salon AT), Silver Trophee 2010 Technical Analyst ( Paris Salon AT), and curently CEO at “Belkhayate Asset Management”. 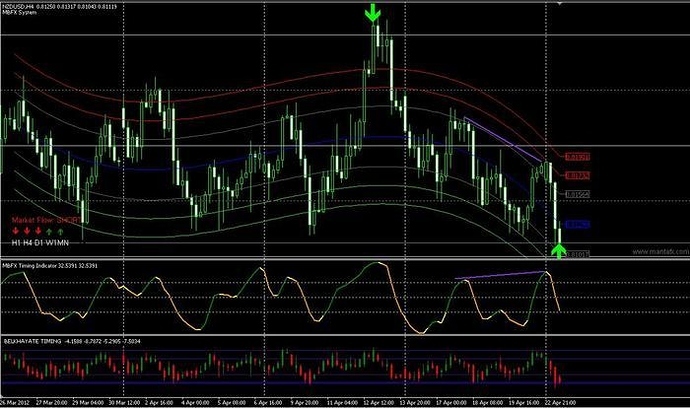 Mostafa said that, respecting the signals, this system has a 80+% ratio of success. [B]The dynamic COG[/B] is the one shown on the price chart: the middle line represents the COG, while the space between the 2 Green lines represent the area where to buy and the space between the 2 Red lines represent the area where to sell. 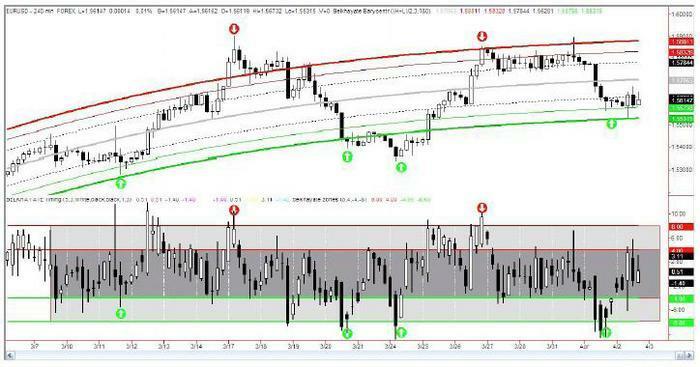 This indicator uses a mathematical formula developed (polynomial nonparametric regression) to calculate first the center of gravity of a moving stock (blue line), then 3 standard deviations to upwards (red stripes) and 3 down (green stripes). The amplitudes of these deviations are always proportions of the golden number 1.618. [B]Different TF analysis! [/B] H1 is showing a buy… but where are we in term of price on H4? is it above or below blue line? what can we expect on longer term? A brief example: took a short trade on NZDUSD, signal appeared on H4, in a point overlapping with a figure + bearish divergence. Result (didn’t catch all the run, as I TP at the blue line, as system says! how do you interpret and use the mbfx timing indicator with the lines instead of candles? could you explain what divergences you look for and is this recommend by the creator of the system as well or is it just your own preference? Sounds like a great system. It also sounds like the Nanningbob system. I dont know if you’ve ever heard of it but I hear it is an incredible system. Are you aware that COG repaints heavily and is a curve fitting indicator? Yes I am, but overlaping it with different signals and static COG seems to let come out a solid system. I just need a wider backtest to analyse it fully, and to use it in correlation with mkt flow and structure to drive the odds in my favour. 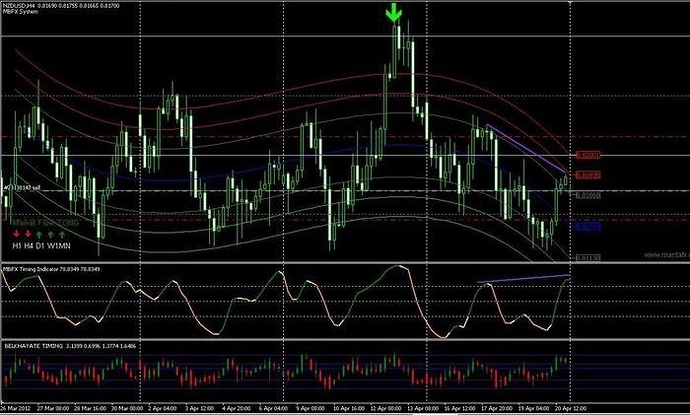 Look up at NZDUSD example to see a divergence example, once again: it’s pretty much used like a stocastich, and I use it as confirmation, to make my entry signal even stronger (to drive odds in my favour a bit more), not as main signal! This divergences analysis was not reccomended by the creator, It is just a use I made of it. At disposal for further doubts! It uses a Moving average (80 or 100 SMA depending on the pair you’re trading). It also uses the same concept of counter-trading/equilibrium price/gravity as your system does, except is also includes a martingale in the system. Just make sure you get a recent one as there have been quite a number of them made and some are not profitable anymore…but the logic is still the same. Does it look good on any other pairs? thx for the reply! another question: what timeframes are you looking at? only 4h? do you know what the creator recommends? because right now for example i see a short on the 1h chart and nothing on the 4h chart. i know, it’s just a smaller swing within a big one so it still could be a valid trade. but what would you say? only 4h? or only trade 4h if 1h gives the same signal? or something like that. Do you have a link providing information of the system and setting up indicators? Please. EDIT: nevermind i thought you were refering to belkhayate, sorry! Also for you, it is free and can be download from the first post of the current thread! As I wrote in the head post, this system is universal on any TF, but I like using H4 and H1 as I try to take less trades but with more profit (less trades=less probability to have a loosing trade).